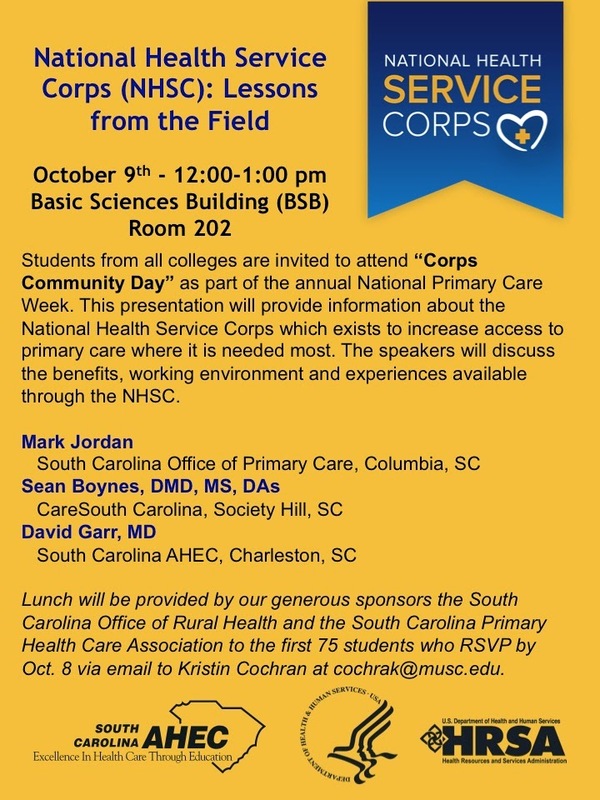 On October 9, health professions students from the Medical University of South Carolina, the University of South Carolina, the University of South Carolina School of Medicine – Greenville, and the Edward Via College of Osteopathic Medicine - Carolinas Campus were invited to attend South Carolina’s recognition of “Corps Community Day.” A presentation was held on the campus of the Medical University of South Carolina and faculty and students at the other institutions were able to participate via videoconference. This program provided information about the National Health Service Corps (NHSC), which exists to increase access to primary care where it is needed most. The NHSC is a federal program that provides scholarships or repays the educational loans of healthcare providers who agree to serve a minimum of two years in a federally designated health professional shortage area. South Carolina AHEC Executive Director David Garr, M.D., served as moderator for the program and shared his experiences practicing in a NHSC site in rural Utah. Director of the South Carolina Office of Primary Care Mark Jordan provided an overview of the NHSC and shared information on scholarship and loan repayment opportunities. Next, attendees viewed four short videos that showcased NHSC member stories. The videos generated awareness about the NHSC and demonstrated the contributions NHSC clinicians are making in their communities. Sean Boynes, DMD, one of the dedicated professionals featured in the videos, attended the event and discussed the benefits, working environment, gratification, and experiences he has had working at CareSouth Carolina, a NHSC site. The program was sponsored by the South Carolina Area Health Education Consortium (AHEC), the South Carolina Office of Rural Health, and the South Carolina Primary Health Care Association. For additional information on the NHSC, please visit the NHSC web page http://nhsc.hrsa.gov/ or contact Mark Jordan, NHSC state coordinator, at (803)898-0766 or jordanma@dhec.sc.gov. 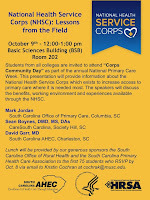 The presentation is available online at http://news.scahec.net/2014/10/national-health-service-corps-community.html.